What’s your first reaction when you see a snake? I was walking through the woods at my local marsh this past weekend when I spotted a snake curled up on the leaves. My first reaction was to move closer to get a shot of the snake. 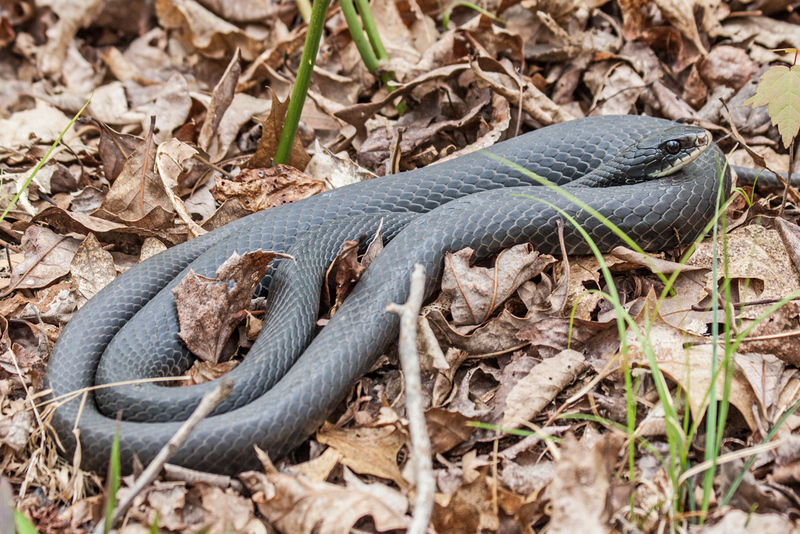 The area was relatively open, but there were lots of leaves and sticks on the forest floor, so it was not really possible to get an unobstructed shot of the snake. I took a shot anyways, fearing the snake would leave, and include it as a second image here so you can see how the snake was positioned. I noticed that the snake’s head was in an uncluttered area and a clear shot seemed possible. I changed lenses from my telephoto zoom to my macro lens, set up my tripod as low as it would go, and moved really close, until the snake’s head almost filled the frame of my viewfinder. I took some shots in natural light and some with my popup flash. The snake seemed unbothered by my actions until I inadvertently moved a small branch when adjusting my position on ground and he slithered away. When I looked at the images on my computer, I was struck by the degree to which my reflection is visible in the snake’s eye. If you click on the first photo, you’ll get a higher resolution view that shows me taking the shot (with flash this time). 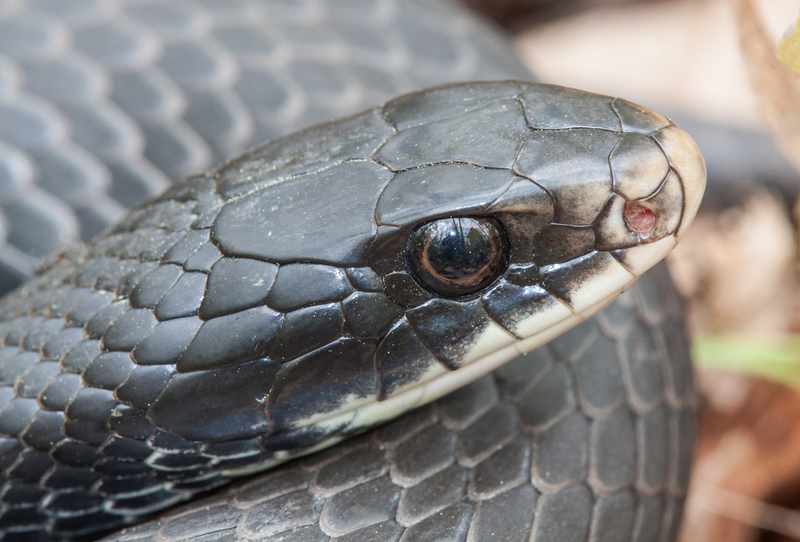 I am not sure what kind of snake this is, but it looks a bit like a Northern Black Racer snake (Coluber constrictor constrictor) as described on the webpage of the Virginia Herpetological Society. I’d welcome a confirmation or correction of my identification from anyone with more experience with snakes. Memories of this past winter’s unusually heavy snowfall are beginning to fade, but were revived when I saw these beautiful little Snowflakes during a recent visit to Lewis Ginter Botanical Garden in Richmond, VA. 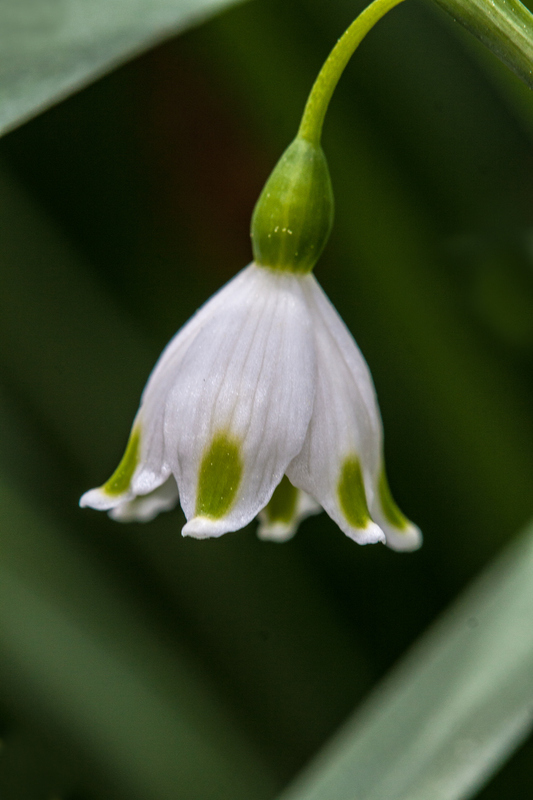 There are two varieties of Snowflakes—the Spring Snowflake (Leucojum vernum) and the Summer Snowflake (Leucojum aestivum)—and I am not absolutely certain which variety I photographed. 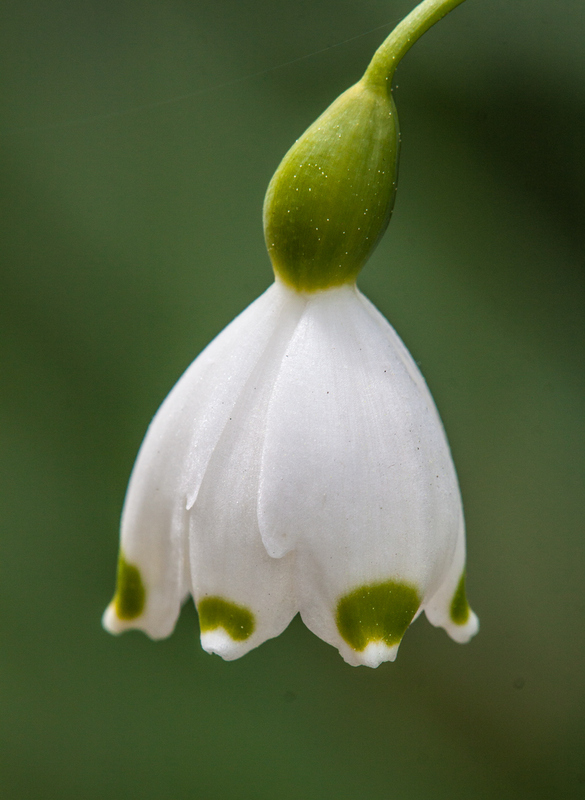 I love the simple beauty of this delicate flower and am happy that I was able to isolate a couple of the blooms to showcase that beauty. 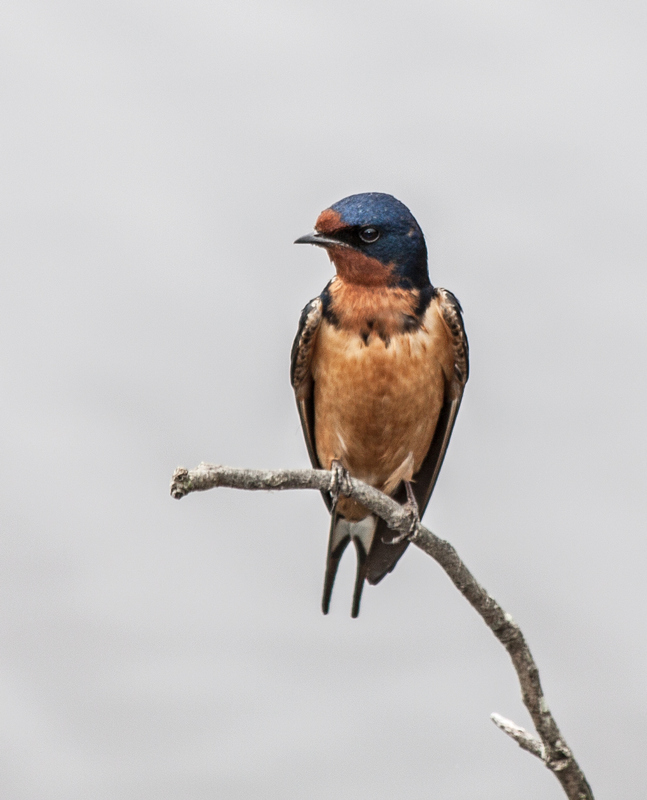 Tree Swallows have been flying about for several weeks, but it was only this weekend that I finally observed one of their multi-colored brethren, the Barn Swallow (Hirundo rustica). Last year, the Barn Swallows built a nest underneath a raised observation platform of the boardwalk at my local marsh, and it looks like they are doing the same thing this year. I was able to photograph this swallow as it perched on a small branch coming out of the water directly opposite the platform. The sky was mostly overcast during the day, which caused the reflections in the water to look mostly white. As I made a few adjustments to the image, the background essentially disappeared, resulting in a photo that looks almost like it was shot in a studio. I really like the swallow’s serious pose and the fact that I was able to capture its signature swallow tail. It won’t be long before I see swallowtails on some of my favorite butterflies. Damselflies are beautiful, delicate insects that are often hard to see and photograph. 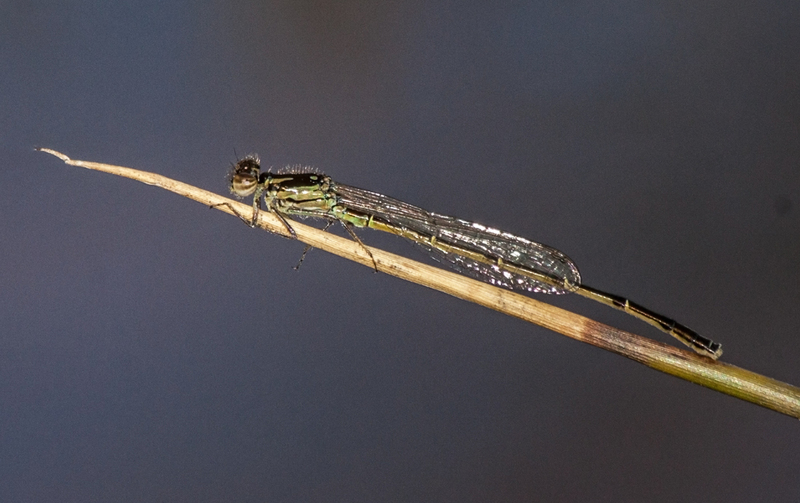 I captured this image of my first damselfly of the year at Huntley Meadows Park this past Friday. 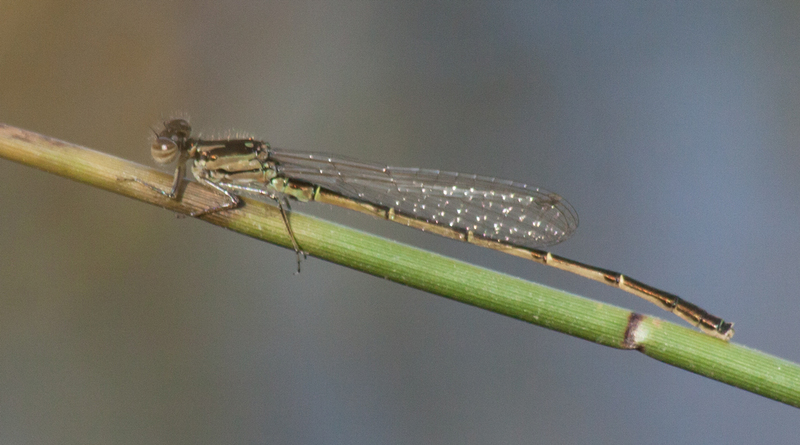 I am not very good at identifying these tiny insects, but think this might be a Fragile Forktail (Ischnura posita). 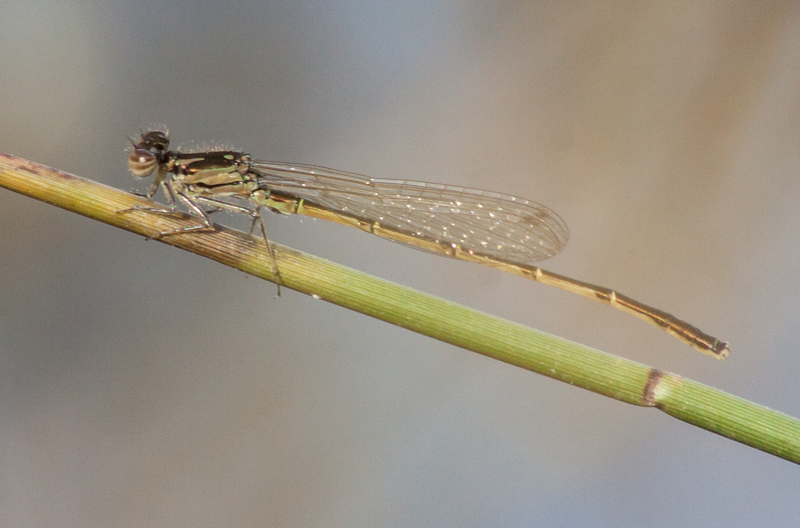 I was standing my the edge of my favorite beaver pond when I saw the damselfly in flight. I followed it with my eyes and was delighted when it landed on a nearby stalk of grass. 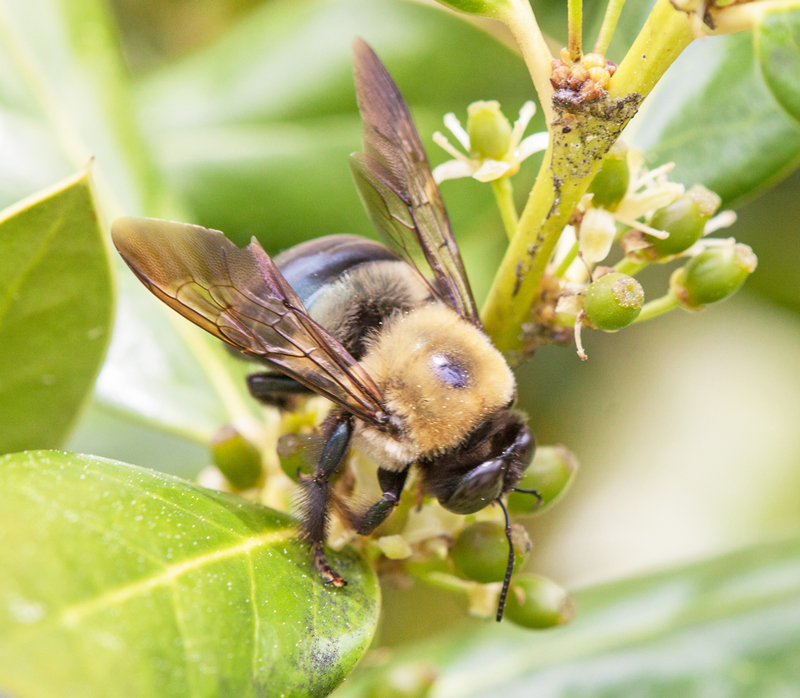 I didn’t have a lot of maneuver, because much of the area at the pond’s edge is covered with thorny bushes, and I had to pull back a bit to get within the minimum focusing distance of my 70-300mm telephoto lens , i.e. 4.9 feet (1.5 meters). At that range, the dragonfly filled a reasonable amount of the frame. Lighting was a bit of a challenge and I tried a couple of different settings as the damselfly lifted its tail from time to time. Eventually, it climbed to the end of the stalk and I changed position too and tried a couple of shots (including the final shot) using my pop-up flash. Most of the time the first shot below is my favorite, but sometimes I like the others as well or more. In any case, I am happy that I was able to get some good shots of my first damselfly of the spring. 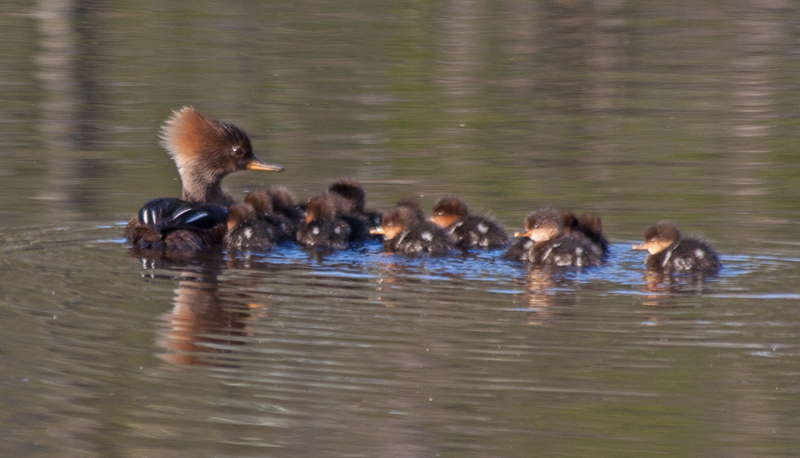 Female Hooded Merganser ducks (Lophodytes cucullatus) raise their ducklings as single Moms, which must be pretty tough when you have so many offspring to look after. 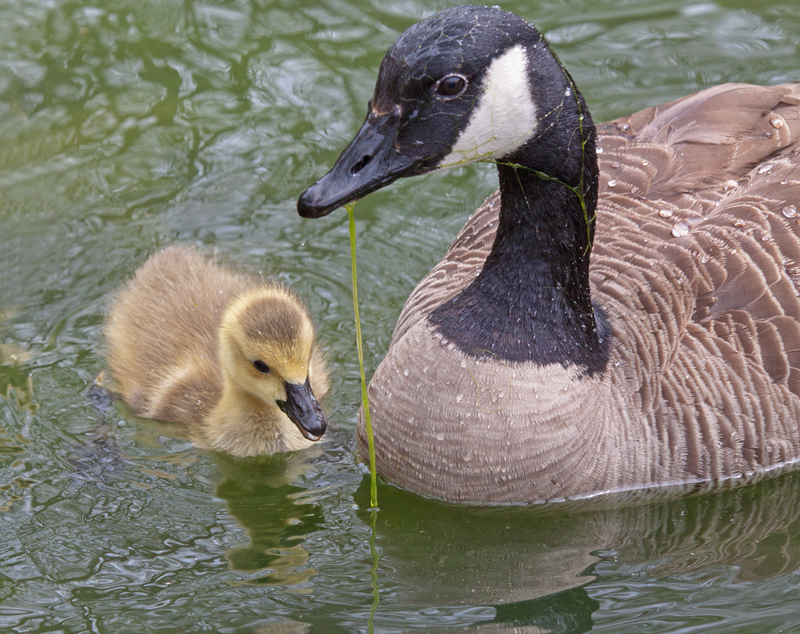 According to the Cornell Lab of Ornithology, the male Hooded Merganser duck abandons his mate once she begins incubating eggs and it’s not known if they reunite the following season. Last year, when the level of water at my local marsh was pretty low and there seemed to be lots of snapping turtles, most of the ducklings did not survive. After a lot of construction at the marsh, water levels are higher and I am hoping that things will be a little easier on the duck families. 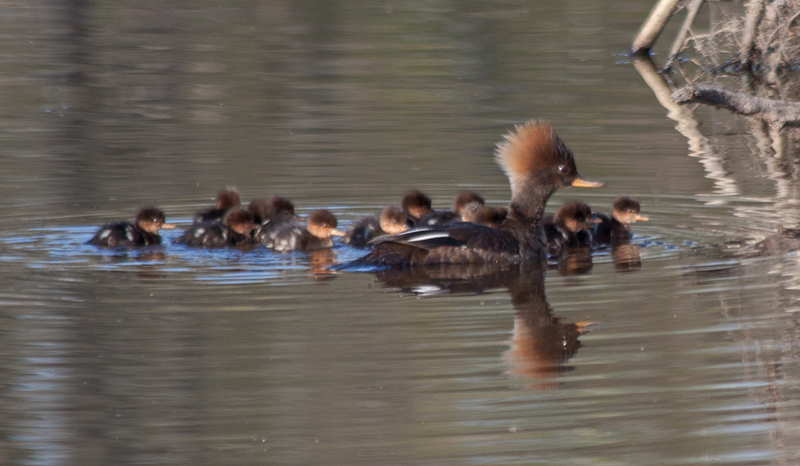 I don’t know how old these ducklings are, but they appear to be tiny—even adult Hooded Mergansers are pretty small. 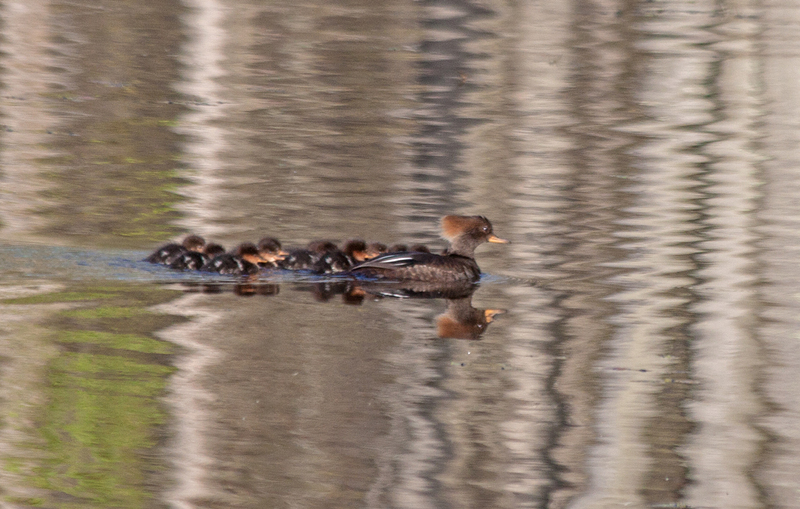 A family of Hooded Mergansers was spotted earlier this week and I suspect that this is the same one, so they may be a week or so old. I was not able to get very close to the ducks and the conscientious Mama duck started swimming away as soon as she sensed my presence early yesterday morning. You can see details in the first two shots, which are cropped a fair amount, but I included a final shot, which shows more of the setting, because I love the beautiful ripples in the water. 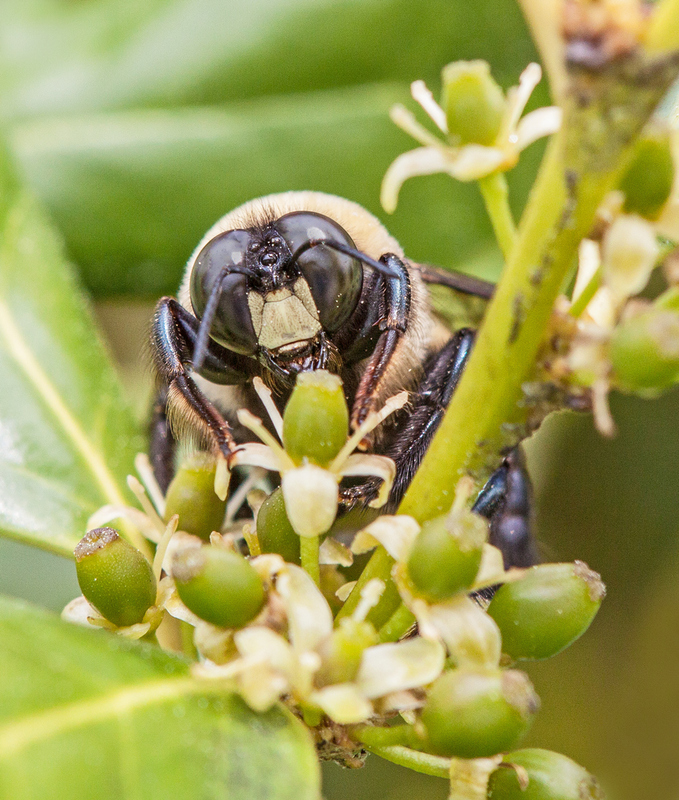 Within minutes of seeing the elegant honey bee that I featured in a recent posting, I encountered this Eastern carpenter bee (Xylocopa virginica), which is built more like a sumo wrestler than a dancer, especially when viewed face-to-face, as in the second image below. 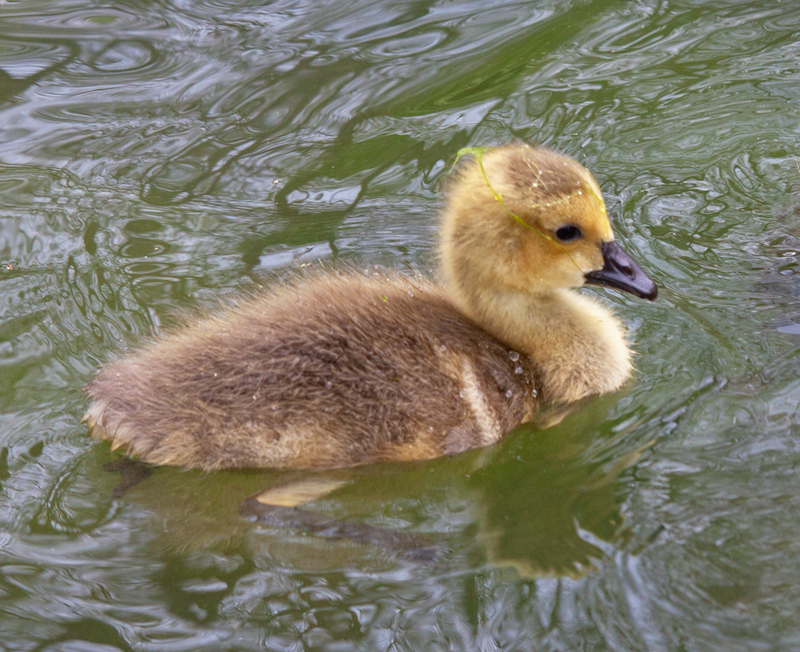 Folks may have mixed emotions about adult Canada Geese (Branta canadensis) and many consider them a nuisance, but I think that just about everyone agrees that goslings are really cute.